I am crazy about this super-easy delicious, non-dairy cake. In less than an hour, with only one bowl to wash this dessert or tea-time treat can be on your fork. I love it with Meyer Lemons (for reasons obvious and also the amazing flowery-fruity taste) but you can vary it with regular lemons, lime, orange, or grapefruit juice for variety or convenience. I mix the whole thing up in an huge measuring cup, pour it into a pan, and before you know it: cake! You can make it in a bundt or springform tube pan, or a regular round or rectangular pan. One with removable sides makes it easy to unmold. It will be lighter and higher in a tube pan (science!) but the denser texture of the cake made in a regular pan is delicious. Use a nice olive oil but not a super strong one, like you would use in a salad dressing. 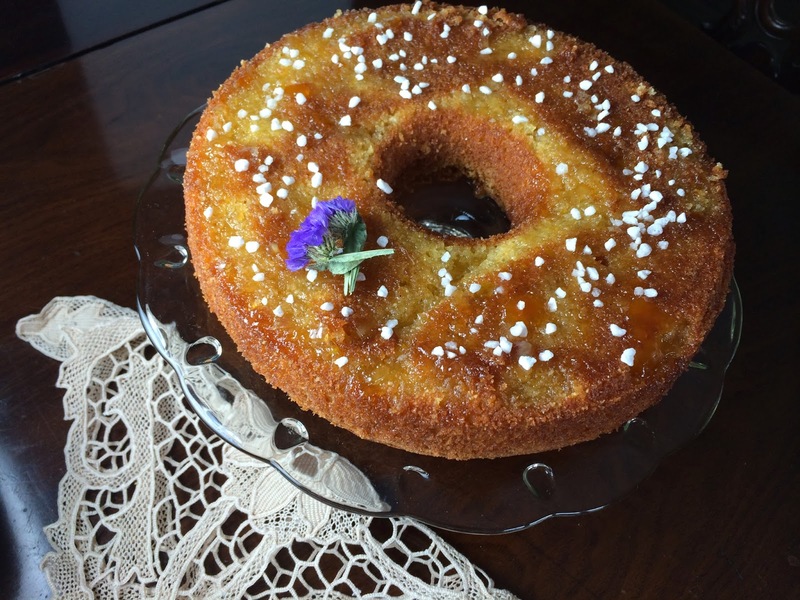 For the glaze, you can make a simple mixture of powdered sugar and lemon juice, or just melt a dollop of your favorite marmalade (lemon marmalade is a no-brainer), and drizzle it over the cake when it is almost cooled. Combine sugar, honey, lemon, and water in a saucepan and cook a couple of minutes until the sugar is dissolved. Add rosemary sprigs and boil, stirring until thick. Stir in the peaches and cook until they are tender, about 4 minutes. Cool in the syrup. Serve warm or at room temperature. In the winter, I love this served with a spoonful of sliced assorted oranges; just find a lovely assortment of different sizes and colors (blood oranges, clementines, mineolas etc- just peel them with a sharp paring knife and slice into 1/4 inch slices. Pre-heat oven to 350F. Oil a regular-sized bundt or springform pan. In a large mixing bowl, combine flours, sugar, salt, and baking powder and soda. Whisk well. Make a "well" in the bowl, and and drop in eggs, juice, and oil. Quickly stir until everything is combined. Pour the batter into the pan and bake for about 30 minutes. When it is done, the edges should be brown and pulling away from the sides of the pan, and if you insert a tester it should come out clean. Cool on a rack for 10 minutes, then carefully remove from the pan. Allow it to cool slightly on a wire rack. While the cake is cooling, melt the marmalade in a saucepan or microwave, or stir up the lemon glaze. Whisk together all of the glaze Then, using a spoon, drizzle the glaze over the cake. Allow to set. Serve warm or cool. Sounds simply delicious and I will give it a shot soon! This looks delicious! I recently started replacing oil for olive oil when I saw a recipe for biscotti on kimkushner.com/blog that called for olive oil and realized that it turns out the same, just healthier and tastier! I cant wait to try this recipe! In the winter, do you poach the oranges as you poach the peaches?